There are a few simple rules that if followed will make catching an edge a rare occurrence. As a snowboarder becomes more experienced they will learn to do these things automatically through the experience of not doing them and suffering the consequences. It is however a bit less painful to learn the basic concepts, so that you don't have to make the mistakes in real life quite so many times on your way to becoming a more experienced snowboarder. The first thing we need to do to avoid catching an edge is make sure the leading edge always has enough clearance. This clearance needs to take into account any unintended changes in the snowboard angle, and for the lumps in the snow. Unfortunately learning how much clearance is enough but not excessive, can only be done through practice. 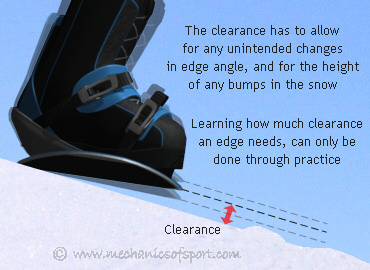 The clearance should also take into account the direction a snowboard is traveling in, as if it is going almost along it's length, less clearance will be needed. As well as getting the edge clearance wrong there is another situation where edges are prone to catching, which is when the edge with the pressure on it needs to be swapped in the middle of a turn. This is more about timing, as the edges need to be changed as the snowboard is going straight along its length, while there is no leading or trailing edge. If the snowboard is travelling in any other direction the pressure will be transferred to the leading edge which can catch. You cannot increase your speed on flat areas as there is no gradient, so there are only really 2 things you can do, try and keep your speed across the flat area, or slow down and stop. If you are trying to slow down or stop this is fine, just don't be too shy about it and make sure you push on the trailing edge, and give the board good edge clearance until you come to a halt. If you are trying to keep your speed or travel any further however, it is very important to turn the snowboard forwards, as if you try to slide sideways, you will need to bring the snowboard as flat as possible, which makes the edge clearance as small as possible, and almost always results in catching an edge. This is probably the most common mistake beginners make to catch an edge, they keep trying to slide sideways when they get to the bottom of a slope instead of stopping or turning the board forwards, and end up lying flat in the snow. Following this rule generally avoids the edge catch situation, where the slope changes angle but the edge doesn't. This rule is along the same lines as the first one, except it applies to when you are on a slope with a gradient. A snowboards direction of least resistance is along its length, and if you are trying to pick up any real amount of speed, that is the direction the snowboard should be pointing. If you try to reduce the boards friction as much as possible but keep the board too sideways and at the same time, you are going to bring the board to about the same angle as the slope. This doesn't give the leading edge enough clearance and it will catch in the snow. If the board is pointing forwards, the edges are at a right angle to the boards movement, meaning you can pick up as much speed as you want without the edges catching. Following this rule generally avoids the edge catch situation where the snowboard angle changes more than the slope will allow. Although you won't always get the edge change right while you are learning, as with learning most things, if you commit to what you are doing and try to do it properly, you are a lot more likely to get it right. This is no different with snowboarding. Definite actions cause predictable outcomes and even if the outcome was more or less than expected it can generally be recovered from. Whereas looming in the middle and not giving any definite input means that you don't know what to expect to happen, and therefore you can't prepare for it. This is where committing yourself to your edge changes makes a difference, as apart from the commitment making it more likely that you will change the edges at the correct point, it also means that you know which edge you are pushing on, and even if you got the timing a bit wrong, you can still expect a reaction from that edge and can try and correct whatever it does. Following this rule makes it less likely for the edge catch situation where the board turns too far without the edge changing to happen. Although not all of these rules cannot always be followed, and there are situations where you need to break them, if you follow them most of the time, they should largely reduce your chances of catching an edge. On to the How to Make Catching Edges Hurt Less section.